As long as barcode is not a feasible solution for many labs yet, LabSuit has it's own solution for chemicals labeling! 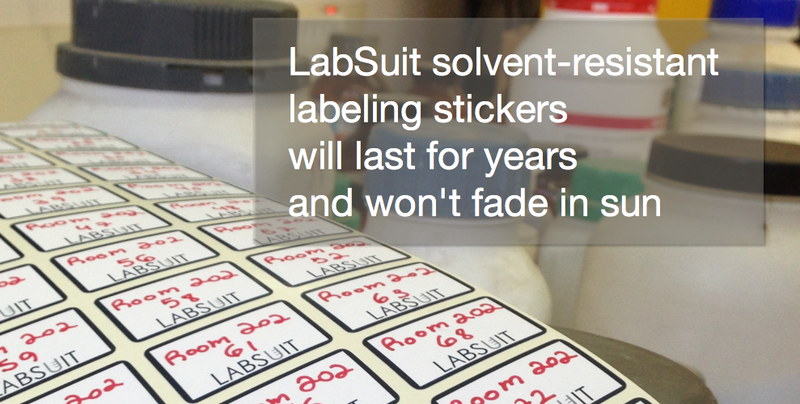 Meet solvent-resistant LabSuit labeling stickers! LabSuit stickers will last for years and won't fade in the sun. LabSuit stickers are solvent-resistant and if used with a proper marker-pen will save you hours of painful search for chemicals! LabSuit stickers play a role of connecting chain between your actual inventory and its digital representation! Having every bottle in your lab labeled with or stickers ensures you don't loose your chemicals tracks! Did I say that we have a specially trained team of lab-fairies that will deploy LabSuit labeling stickers at your lab? Learn more about LabSuit lab fairies!